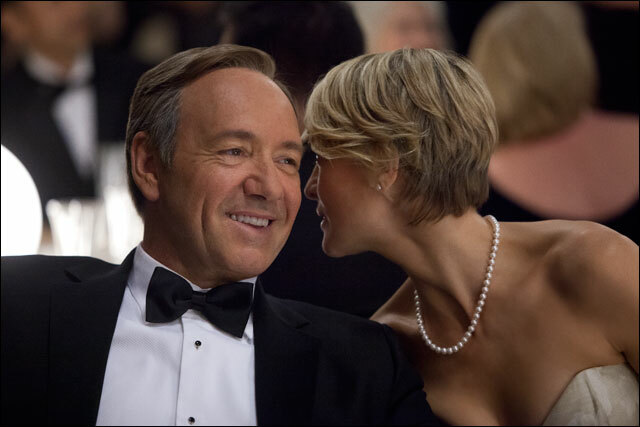 When “House of Cards” bows Friday, Netflix will find out whether a big-budget original scripted series can be launched outside the traditional TV ecosystem. But that’s not the only conventional wisdom about TV programming being put to the test. A BBC drama adaptation starring Kevin Spacey as a corrupt politician, “Cards” will defy the medium’s traditional weekly scheduling pattern by having all 13 episodes of its first season available at launch. And that’s where Netflix is making a mistake. Questioning the wisdom of so-called binge viewing may seem like heresy to fans of Netflix. Subscribers’ ability to gorge themselves on episodes from the service’s vast TV library is a big part of its popularity. CEO Reed Hastings made his disdain for how antiquated linear channels are in his letter to investors accompaying Netflix’s resurgent fourth-quarter earnings last week. But the irony of Hastings depicting linear scheduling as a remnant of some previous incarnation of TV is that binge viewing could be seen as a vestige of an earlier era of Netflix — one before its increasing emphasis on original programming and exclusive licensing transformed the Los Gatos, Calif.-based company in ways it may not fully understand. Hastings’ sentiment cuts to the heart of the strategic philosophy those in Silicon Valley love to lord over Hollywood, which gets knocked for creating exhibition windows for content aimed more at maximizing revenue streams than giving consumers what they want, when they want it. The appeal of binge viewing isn’t difficult to comprehend. Anyone who has been left on pins and needles by a great episode of TV only to have to wait to another week, or conversely, sat bleary-eyed in their living room for hours on end, knows its power firsthand. But the efficiency that makes binge viewing so compelling also accelerates the time a consumer spends with Netflix. A relationship with a program that might otherwise drag out over months on a linear channel is telescoped into hours. And therein lies the paradox inherent in Netflix’s business model: Allowing consumers to consume at their own speed contradicts the company’s financial imperative to keep them on the service paying the seductively cheap flat monthly fee of $8 for as many months as possible. Sure, it’s possible Netflix has assembled a library so vast — over 40,000 episodes of TV and counting — that a subscriber can fill countless months hopping from one binge experience to the next. But let’s not forget that the whole point of Netflix embarking on an original programming strategy is to bring in new subs by offering a different value proposition. These are consumers who didn’t feel compelled to sign on to binge on library programming, but they’re interested in seeing a buzzed-about new show like “Cards,” and other originals still to come. So when new subs polish off “Cards” in less time than the month they paid for, they’ll quickly have to confront the issue of whether they are getting their money’s worth. Netflix is betting to work its algorithmic magic on these subs by getting them hooked on other programs from its library. But that’s a risk because that’s not primarily why these customers signed onto Netflix. It’s not like another original series will be waiting for them as soon as they’re done with “Cards.” The next series on Netflix’s slate of originals, Eli Roth’s “Hemlock Grove,” isn’t due until April and the revival of Fox’s “Arrested Development” doesn’t begin until May. Thus, getting new subs to pay for a second consecutive month of services becomes at least a little less likely. But if the 13 episodes of “Cards” were parceled out in the traditional weekly, installments, you could hook a viewer to pay for at least three months instead of just one. Yes, the binge opportunity makes Netflix all the more addictive. But compelling the viewer to pace their programming consumption will generate more revenue. Netflix can’t afford to not to be more aggressive about monetization. With nearly $2.5 billion in streaming content cost obligations on its books for 2013, according to a Wedbush Securities estimate, and questionable growth prospects both in the U.S. and abroad, getting the most out of its existing customers is essential. But let’s do Netflix a favor and take it on faith that new subs will transition from originals to library content. That potentially wobbly presumption rests upon yet another untenable presumption, one that puts not only a question mark over the long-term traction new subs will have with Netflix but even more so over the existing subs that have already been streaming for a while: Will Netflix’s catalog continue to grow at a rate capable of sustaining all this frenzied feeding? EARLIER: Look, Ma, a ‘House of Cards’ billboard! Because Hastings has very clearly indicated that Netflix is moving away from its initial emphasis on the depth of its catalog to one that puts a premium on differentiation from competitors in the subscription VOD space like Amazon Prime and Hulu Plus. While sound from a competitive standpoint, the strategy essentially means Netflix is paying more to keep titles out of its rivals’ hands and getting less volume in its catalog. To wit, Netflix declined to renew a subscription for a cache of hit unscripted series from A&E Networks last year totaling over 800 hours of content. If Netflix is facing a future with a more selective library, all the more reason it needs to be more conscious about subs’ consumption rate — particularly among longtime subs who may already being experiencing a sense of diminishing options. There are still other future considerations in the SVOD market that will make binge viewing harder to economically sustain. The influx of new competitors like Amazon Prime will make it harder to secure consumers’ disposable income, which is already under pressure in a tough economy. And just imagine, as many analysts predict will happen, if usage-based billing becomes the norm for broadband bills — Netflix will be forced to forego binge viewing. Better condition its users to have some limited sense of rationing their viewing hours now then after it’s too late and feels like an imposition. Perhaps Netflix is counting on sheer inertia among its subs, who will just be too busy binge viewing to suspend their subscriptions. But as HBO knows all too well, churn is a persistent problem for even the most successful pay-TV channels. And opting out of Netflix is far easier. No interminable phone call with a customer service representative, just a few clicks on Netflix.com and they’re out the door. If weekly installments are simply too anachronistic for Netflix’s tastes, there are still other scheduling options Netflix could provide that are in the spirit of binge viewing instead of releasing all 13 episodes at once. Why not deliver four episodes at the beginning of each month instead of 13, providing a mini-binge opportunity? Or maybe drop all 13 at once, but make those who want to watch beyond the first four to commit to paying for an additional month for each additional four episodes consumed. It’s not adding a surcharge — Netflix’s rigidity about maintaining a flat fee is spot on — but accelerating the timing of future payments. But perhaps the greatest danger posed by Netflix’s binge-centric business model may be understood less in terms of its subs’ revenue contribution but in their ability to serve as evangelists for “Cards.” It stands to reason that the series’ most fervent fans are among the ones most likely to binge on the 13 episodes — and that poses a problem from a marketing perspective. Hastings can knock traditional TV’s weekly distribution method all he wants, but perhaps he’s blind to the inherent value in stretching out the period of engagement a fan has with a favorite show. The longer a series runs, the longer time it is generating earned media. For “Cards,” ardent bingers will make for pretty passionate brand advocates in the days, maybe weeks, after they’ve gobbled up the first season, but will they be talking it up at the watercooler for months the way a series like “Homeland” is as the buzz of its 13 episodes gets dispersed across a broader time span? No matter how high-tech Netflix fancies itself, it’s old-fashioned word-of-mouth recommendations from fans that are the most effective ambassadors for a brand. If binge viewing is foundational to Netflix’s business model, can’t we take it on faith that a company this avowedly data-driven is seeing behavioral patterns among its subs that give Hastings every confidence that this is the way of the TV future? After all, “Cards” isn’t entirely uncharted territory for Netflix. When it premiered early last year, Scandinavia comedy “Lilyhammer” was for all intents and purposes an original series to its U.S. audience, which was also afforded the option of watching the entire series in one sitting. It couldn’t have been a disaster considering “Lilyhammer” will return to Netflix for a second season. But it’s worth noting that for all the hype about binge viewing that Netflix openly cultivates, the company hasn’t actually shared all that much evidence as to how pervasive the behavior is. Sure, we’ve seen some eye-popping stats like the 50,000 subs who watched all 13 hours of the fourth season of “Breaking Bad” on a single day before the next season began on air. Extreme behavior by Netflix’s own description, but just how extreme is it compared to Netflix’s average sub anyway? Perhaps the data leads Netflix to believe binge watching will be the choice of a significant segment of the viewing audience years from now. But just as Netflix believes its own global audience has the potential double or triple, it also has to reckon with the possibility that the early adopters who are already in the tent may not be representative of the more casual breed of viewer to come to the service, the kind for which binge viewing doesn’t hold the same appeal. “Cards” may well represent an inflection point for Netflix sub growth. But that doesn’t mean what got consumers in the door at an earlier stage will be continue to be the lure going forward.